My family’s noses rippled when they heard that I was going to visit Oman. Oman? It was similar to the reaction I had when a top surgeon forsook a world-renowned Chennai hospital and shifted base to Muscat. A wily move he made, I’d discover, for the Sultanate is a premium destination. Here you have wide skies that are uninterrupted by concrete thrusts. All that slices the skyline are streaming mountain ranges and craggy escarpments plunging into gorges or rippling out into silken deserts. 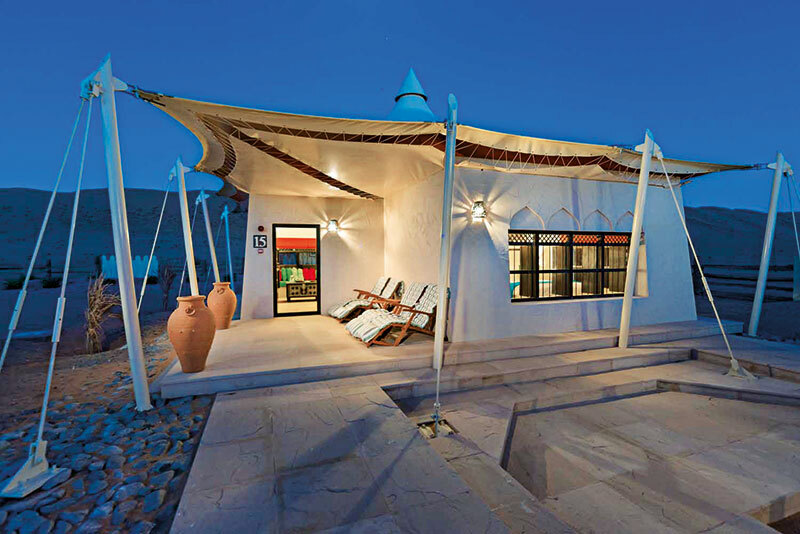 Oman is a colossus of natural beauty, diverse and dramatic. There are blue seas and bleached beaches that camels sunbathe on. 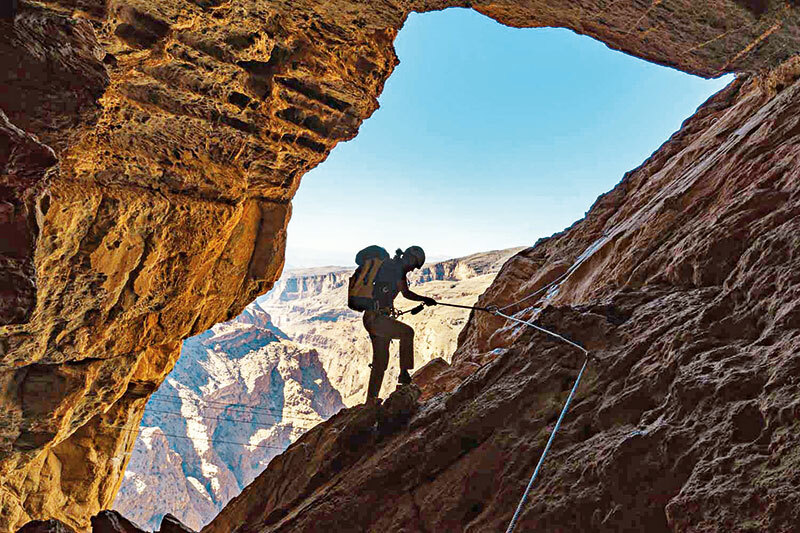 You have sinkholes to swim in and wadis, and dry stretches of riverbed that are suddenly aglitter with sharp, clear sapphire, emerald and aquamarine water, wedged between soaring cliffs. Here lies Oman’s uniqueness. “Can you spot our resort?” asks Angel from Alila Jabal Akhdar, as we drive up the jagged-edged Jabal Akhdar mountain that is dotted with hoary trees. The resort’s facade, chameleon-like, melts into nature. The outdoors invade this lofty perch made of stone, wood and indigenous materials, through floor-to-ceiling glass windows. I’m in the Rose Lounge enjoying the invigorating ‘oneness’ with nature, when my therapy session, as it were, is rudely interrupted. A woman toting a Prada bag the size of a suitcase pounces on one of the complimentary scones and peremptorily bellows, “Are these fresh? !” My serenity shattered, I move out to the infinity pool that appears to plummet down a precipitous cliffside. Thrilling views, but also chilling weather. And so I submit myself to an Alila Milk and Roses treatment in the spa. The next day I’m allocated a more authoritarian guide, Salim. We descend 200-million-year-old rocks overlooking plantations of date palms with lavish, outstretched fronds invoking the heavens and walk through an abandoned village into a dry, narrow riverbed between vaulting mountains that ends in a cold pool. Then we clamber uphill, saluting gluttonous goats, donkeys and baby foxes. You feel like you could eat a horse after the trek, but the Juniper restaurant doesn’t serve any! Instead, Kiwi Chef Alex Ensor delivers fresh food that captures the vigour of these parts. Salads with pears, dates and walnuts; baby winter veggies in a rose water vinaigrette; or fennel, red endive and blood orange with mint pomegranate. So, I dine healthy. Breakfasting al fresco on enthralling views and home-made granola, agleam with emerald pistachio shards and ruby studs of cranberries, I devise a plan to kidnap supercool guest services supervisor, Rina Ibrahim, who I make my indispensable PA. I eventually abandon the mission, as nothing can be smuggled past Alila Jabal Akhdar’s security post, and prison will not enhance my wellness. But the citrus welcome elixir with a hint of ginger does, I learn at The Chedi Muscat. Wellness is about quality victuals, attested to by their breakfast; the invitingly arranged and freshly cut fruit at a live station, is vibrant, breads to match those in France, and the rich, churned butter is from France. The crème de la crème, literally. The seafront hotel, with tufts of untamed, beach-embracing heather, is a maze of geometric water gardens where parrots and mynahs play. Mini fountains dot manicured lawns. Of the three swimming pools, one conveniently sequesters bawling children away from the adults, some of whom stretch their groomed bodies by the beach-front pool, while most relax at the famed Long Pool. Although you wouldn’t associate a bar with wellness, my most refreshing discovery is during cocktail hour at the library, where Naresh Barla can concoct a cappuccino or a cosmopolitan. Barla is from an Andhra village, where his family didn’t have enough to eat, and came to Oman as a cleaner. He insisted on transferring to the bar, despite being the lone Telugu-speaking employee. Today, bandying his English, he smilingly reveals that he hadn’t even known about hotels while in his village, but now shakes cocktails at one of the world’s poshest addresses. A triumph of the human spirit, amongst other spirits…. Chin-chin. If you don’t have a spa, a CEO who massages egos will do just as well. In a strange coincidence, Srinith De Silva, Desert Nights Camp’s CEO, had hosted me at a resort in Tamil Nadu precisely seven years ago. The Omanis believe in magic and genies; what transpires leads me to do so as well. I wish to stay at the the camp. It’s sold out. “Create a room,” Da Silva instructs with his characteristic composure. As if by magic, the doors open. 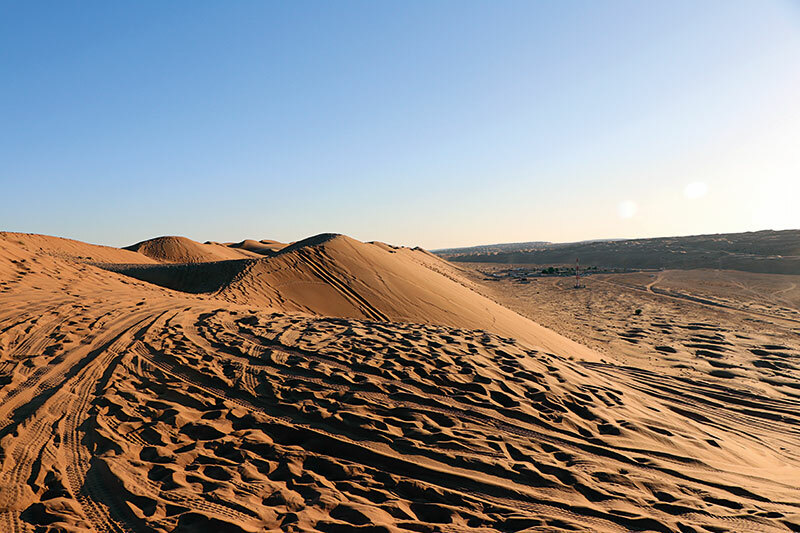 Next, I experience ‘dune bashing’, a form of off-roading done over white, red and yellow dunes in the Wahiba Sands desert. For relaxation afterwards, I have a dune-top masala chai and a splendid sunset. Quo vadis? To the wadis. Where else in Oman? Desert Nights treats me to an under-the-heavens fish pedicure at Wadi Bani Khalid, where you dip your legs into the wadi’s limpid waters and fish dart around, pricking you, needling out dead skin. Your feet emerge, glistening in the Omani sunshine. Desert Nights also sends me to the Wadi Tiwi and Wadi Shab, two of Oman’s most monumental experiences. An hour’s hike, spent reeling over dizzying rocks (that caused some US marines to clutch me by the waist and swing me across in a sort of wild ballroom dance) finally lands me in a rock-enclosed pool that is brilliant with shades of blue, like the fanned feathers of a dancing peacock. But if you seek a sensual spa, then it must be the one at the Anantara Al Jabal Al Akhdar Resort. It offers white marble hammams and the Rose Ritual with rose oil and other sumptuous products exclusively created for the Anantara Spa, which over a massage and facial, provides you with all the fragrant splendour of Jabal Akhdar. The swankiest five-star hotels may not have the tastiest food, and the most cosseted spas may not have the most relaxing massages. 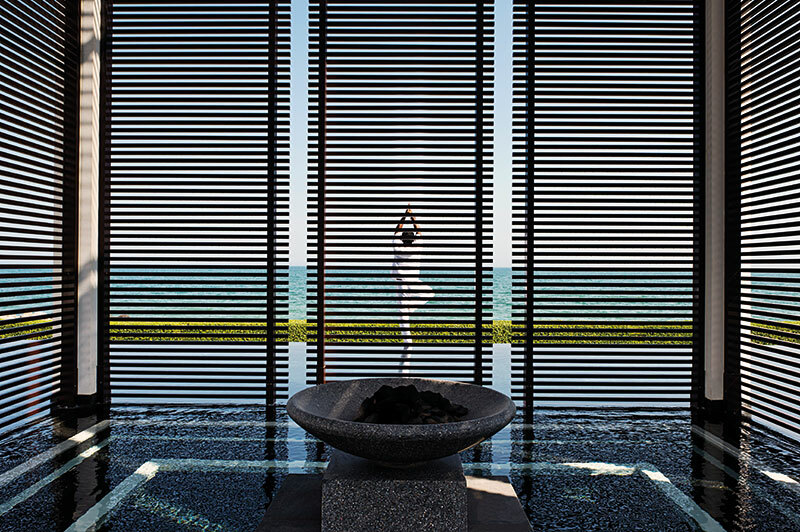 Rotana Salalah’s spa is no design sensation, but has the best masseuses I’ve experienced in a long time. Try Carla and Lea for their signature Aromatherapy Massage or Muscle Activation with calming oil. Between massages I rush from east to west Salalah, visiting Job’s Tomb and the UNESCO-marked frankincense park, Wadi Dawkah, the latter of which, I am told, used to furnish frankincense to the Queen of Sheba. 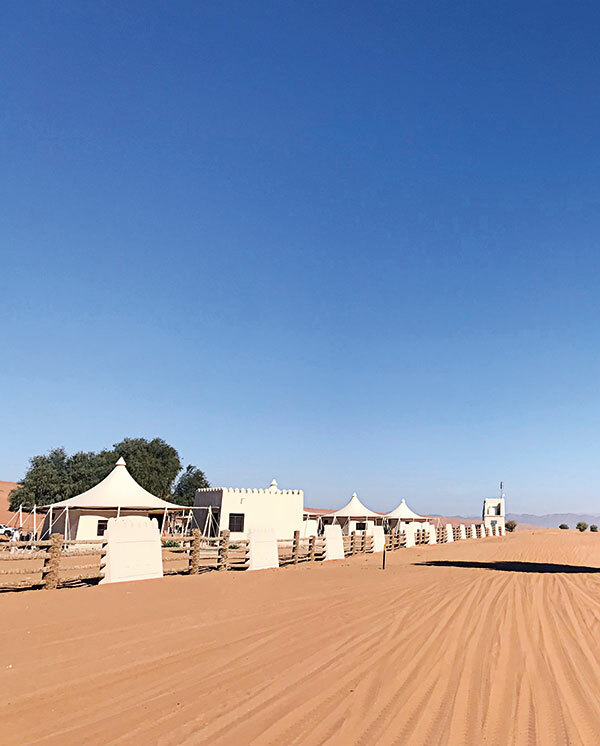 The Sultanate has left me feeling like a queen enveloped in luxury and I think back with amusement at my family’s rippling noses….